The Retractable Leash Ultimate from KONG is an extra strong retractable leash for large and strong dogs. With this robust retractable leash, even walks with the strongest dogs are comfortable. The KONG Retractable Leash Ultimate is the ideal solution for owners of extra large and strong dogs. This retractable leash from KONG has been specially developed for dogs weighing up to 70kg. With this strong retractable leash, you can even keep the strongest dog under control whilst walking. What's more, the soft grip in the handle ensures that walks remain comfortable. 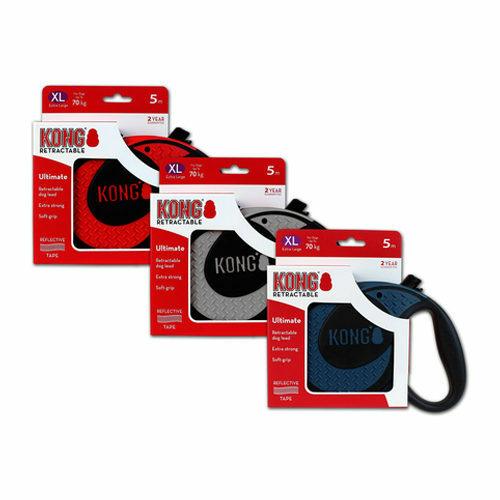 The KONG Retractable Leash Ultimate is available in blue, grey and red. Have you used KONG Retractable Leash Ultimate before? Let us know what you think about this product. I purchased this lead on 14th of February 2019 from yourselves. I bought the lead from what I was told from the advertisement. Stating it is a robust lead and very strong and it was designed for a big dog like a alsatian. My cockapoo has only had the lead less than a month he does hold the lead in his mouth when you are putting his harness on. I have stopped him from doing this as I feel it may be weakening the lead. Having said that I thought I was buying a quality product with the lead costing £36.20. But I am very disappointed in the product at this moment in time and I don't think it should be named after one of the strongest creatures in cinema history (King Kong) more like Mickey Mouse lead. The scoring above, doesn't score minus or I would score it minus 100%.